For years now, I have sat on the bench in the Garden of Fragrance at the Rochester Museum and Science Center looking across at the Whispering Dishes pondering a weighty question. How do they work? I often take friends and visitors to the RMSC and those mysterious red saucers. We have whispered into them. Spoken in funny accents, in falsetto, mumbled, screeched, stuttered, gasped, belched, snorted, howled, chuckled, tittered, hiccupped, whistled, clapped our hands, clicked our tongues and used cell phones. And the result is always the same. The people at the other dish can hear and understand us. It must be magic. 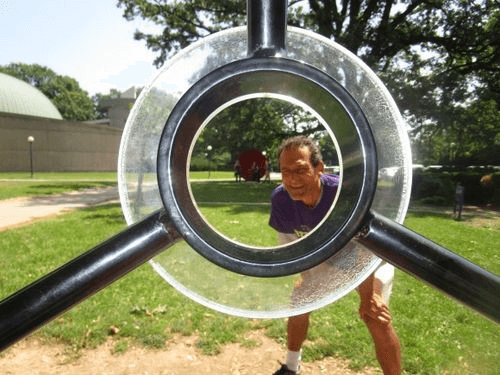 The Whisper Dishes are parabolic dishes, meaning they are curved in the shape of a parabola. Parabola-shaped dishes collect, focus and amplify wave signals, including light waves, radio waves and sound waves. The circle at the center of the dish is the focal point. When a sound originates at the focal point, sound waves reflect off the dish and travel perpendicular to the direction the dish is pointing, sending the sound waves across to the partner dish. The incoming waves then hit the second and reflect again, perpendicular to its curved surface. The reflected sound waves are collected and amplified at the second dish’s focal point, where hopefully, there is a partner to listen. 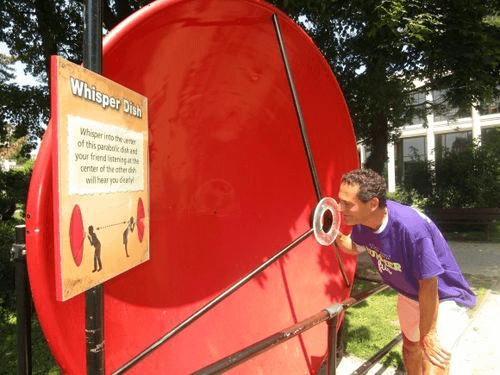 My favorite stories about the whisper dishes all revolve around the same phenomena: excited visitors, usually children, running up to the dishes to use. They encourage a friend, often an adult, to listen on the other. When they get to the dish, they reach up on their toes, put their mouth to the focal point and start to yell, “CAN YOU HEAR ME?” Maybe we should make the word “Whisper” in the title a bit bigger. So there it is. Come discover for yourself the magic. 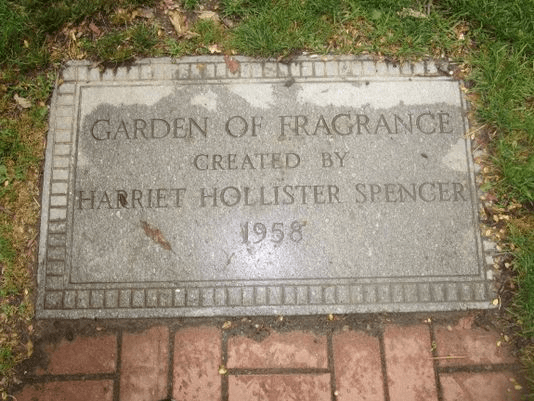 The experience–not to mention the RMSC shirt Calvin gave me–cemented my feeling that the bench in the Harriet Hollister Spencer Garden of Fragrance is my one favorite spot in the city of Rochester. Another weighty summer question. What is your ONE favorite spot? POSTSCRIPT On 8/7 I attended the Lights Out evening event at the Museum. 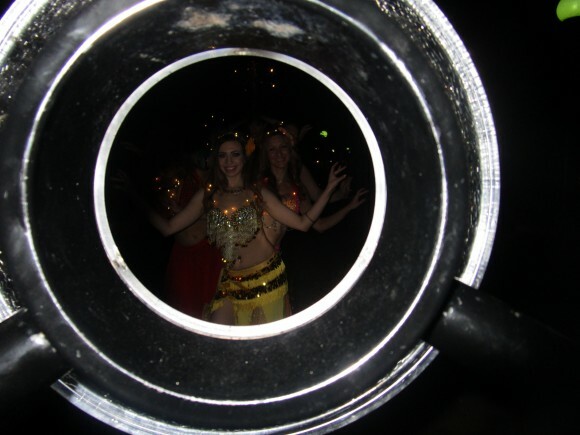 There, the Fire and Spice Bellydancers performed alongside the Dishes. From the bench at the Garden of Fragrance, one never knows what dishes will appear. It’s magic!